Manchester United's victory parade at Stamford Bridge was predictably anti-climatic, as Sir Alex Ferguson's newly-crowned champions played out a largely uneventful 0-0 draw with Chelsea. The Blues, as promised, formed a guard of honour following United's first title win in four years, but the noble gesture seemed to lose its impact when novices Dong Fangzhou and Kieran Lee emerged from the tunnel despite having failed to play a single minute in their team's league campaign. The slightly farcical nature of the whole evening - given United's dramatically-weakened side and the unimportance of the outcome - resulted in a poor first half that offered no clues whatsoever as to what awaits in the FA Cup final between the two sides on 19th May. The second half was an altogether more intense affair as the rivalry that had seemed buried beneath a raft of changes began to rear its head. Unfortunately, there was little in the way of goalmouth action for Sir Alex Ferguson and Jose Mourinho to debate over their traditional bottle of post-match wine. Manchester United's makeshift side struggled to find any rhythm in the early stages and it was Chelsea, with far more quality in attack, who posed all the problems at Stamford Bridge. A wonderfully worked move involving Salomon Kalou and John Obi Mikel saw Shaun Wright-Phillips earn a sight on goal on seven minutes, but after a superb first touch the diminutive winger failed to beat Tomasz Kuszczak with his finish. The former Manchester City man then saw a mis-hit cross float just over the bar, whilst from another of Wright-Phillips' deliveries Lassana Diarra glanced a header wide of the upright. Teenage forward Scott Sinclair - making his full debut for The Blues - impressed in bursts from his position wide on the left, but for all his speed and trickery the former Plymouth loan star was lacking a finish when he skewed an effort high and wide from the edge of the box. In a game that was understandably nowhere near the usual intensity of a top-of-the-table clash, Mikel - playing for the first time against the team he so controversially snubbed - provided a brief flashpoint when he earned a booking for a nasty-looking lunge on United midfielder Chris Eagles. John Terry's elbow also caused Kuszczak some consternation from a corner and the Pole required treatment for a facial injury, whilst Kalou looked to inflict pain of a different sort on United as he fired over, before then appealing in vain for a spot-kick after some nice close-control in the box. 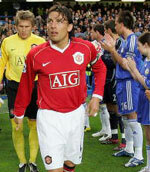 United only briefly threatened when Gabriel Heinze took advantage of some hesitant defending to steal in behind Chelsea's backline, but the Argentinian could only toe-poke the ball wide of Carlo Cudicini's left-hand post. Chelsea responded as Claude Makelele and Sinclair both attempted to stab the ball home after Kuszczak had dropped a cross under pressure, but as the minutes ebbed by a poor effort from Dong on the turn was symptomatic of the general lack of quality on display at Stamford Bridge. Mourinho sensibly removed Mikel at half-time to protect the hot-headed midfielder ahead of the FA Cup final, and Joe Cole was introduced in his place to add some class to proceedings. Instead, it was United who lost their discipline in the early stages of the first half as both Lee and Brown were booked inside the first two minutes for fouls on the right flank, and Diarra soon joined them as referee Graham Poll lost his patience. It seemed harsh on the young Frenchman following an innocent foul on Eagles, but Richardson nearly made The Blues pay from the subsequent set-piece as he curled his free-kick narrowly off-target. Chelsea were forced into a change on 54 minutes when an injury resulted in Sinclair being replaced by another teenage forward, Ben Sahar, and the Israeli was denied an early chance at goal when Wes Brown produced a superb clearing header from another Wright-Phillips cross. A volatile second half continued to simmer when Essien was booked for dissent, and Eagles - having been denied a penalty just seconds earlier - infuriated Chelsea's players with a wild challenge on Wright-Phillips that earned him a caution as well. On 68 minutes, Chelsea enjoyed the first real chance of the second half after working the ball nicely across the face of goal. However, Wright-Phillips could not power his shot far enough away from Kuszczak to give the keeper any real problems. The Pole was called into action again soon after when Kalou turned Brown and drove a low shot at goal, and Ferguson responded to the increased threat by bringing on Wayne Rooney for Dong - whose Premiership debut brought the phrase 'a fish out of water' to mind. Mourinho - in contrast - was more concerned with Poll's decision making and was temporarily forced to take residence in the seats behind the Chelsea bench after gesticulating too wildly. However, his stay in the naughty corner was short-lived, allaying any fears over a possible touchline ban for the upcoming cup final. Chelsea's superior experience began to tell as they pushed for a winner in the final ten minutes, but Kuszczak was equal to efforts from Diarra and Kalou, despite also dropping a cross to almost allow John Terry to head home. The Blues clearly sensed a win was there for the taking, and Sahar was inches away from sealing all three points in the dying moments when his shot from Cole's corner was cleared off the line by United youngster Lee.